I’m feeling a little delicate today. It was D’s sister’s Hen do yesterday. There were quad bikes, there was a salsa lesson, there were tapas and there was sangria, champagne and wine. It was fabulous but, man, am I suffering for it today. Dinner had to be simple tonight. And so it was. Add the oil, garlic and chilli to a small frying pan and set over a low heat. Warm very gently until the garlic starts to sizzle. Remove from heat and stir in the parsley and a generous pinch of salt. Boil the pasta in plenty of salted water. Drain and toss with the garlicky oil. Avoid breathing on people for the next 12 hours. Sounds like the ultimate hangover cure ! Certainly tastier than Fernet Branca . Here in the Pacific Northwest USA we have some Pub/Micro Breweries (http://www.mcmenamins.com) that serve a similar pasta dish with much garlic, diced tomatoes, spinach chiffonade and roasted hazelnuts in brown butter with Parmesan cheese. 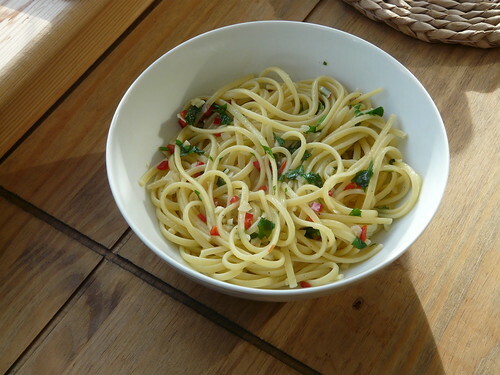 They call it High Pasta and it is something I could eat every day. Oh! Yummmm. and their Ruby Ale….mmmmm! Look at you on that quad! What fun! The day sounds like an absolute blast and worth the hangover. How fun! I also was celebrating my friend’s Hen this weekend in Kampala-I have lost a weekend of my life…reminds me why I don’t do it very often! Wow, sounds like you had a fantastic day! Agree with your day after choice, that, with a few extra zzz’s should set everything right! This seems like an easy receipe to try thanks. 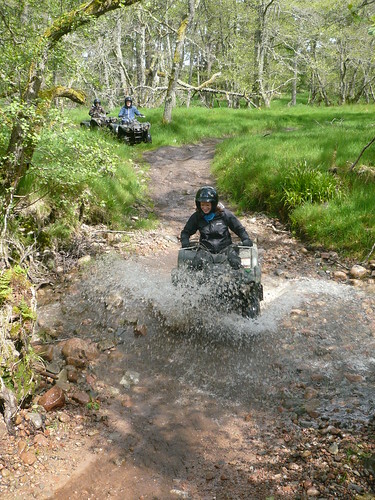 Quad bikes look fun. Your recipe is so simple , yet very captivating. I was browsing your blog , n all of a sudden my eyes sighted this easy, yummy recipe of yours. So Simple, yet so lovable n savoury. Cheers to your so simple recipe. looks gorgeous. Wendy, looks like you had a brilliant time!